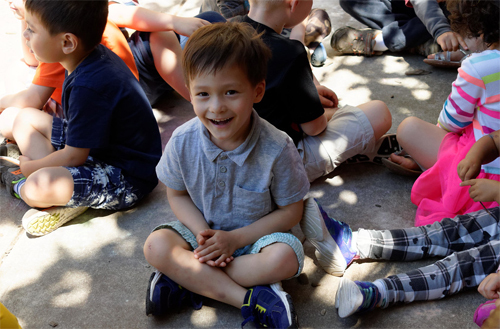 Our summer camp for primary students (ages 3–K) features an experienced English-speaking lead teacher plus a fluent speaker of either Spanish or Mandarin Chinese to assist. Camp instructors create a welcoming environment full of learning and fun. Each week, we focus on a different theme, exploring topics from bugs and insects to outer space and art around the world. Camp days are filled with games, singing and dancing, outdoor adventures, and other fun activities. Montessori principles govern the classroom, and a Montessori-certified teacher supports and encourages emerging readers. Primary camp students likewise have access to Montessori materials as we integrate language, sensorial, geography, community, and math lessons into our daily work and play. Weekly tuition for full-day camp is $330, $240 for half-day camp. Add-ons such as extended care and lunch are available for an additional cost. Registration for Summer Camp 2017 Is Open! Dive into natural science and discover bugs, bees and blooms! Red, White and Blue oh my! Discover Independence Day and our great state of Maryland. Take a journey via art projects and science experiments to learn about earth, inside and out! Reach for the stars! Join us for an exciting ride to the sun, moon and stars. Week 5: Food & Cooking, Let’s Eat! Our chefs will prepare, cook and serve yummy healthy foods while learning about healthy choices. Children will exercise their gross motor skills while enjoying yoga, dance, and fun movement games. Where do you live? What animals live in the rainforest, the ocean, and the sky? What about your neighborhood? And in your home? Let’s explore animals. Our artists will be introduced to a variety of art, such as Impressionism, Pop, and Abstract, and create masterpieces of their own. How did you do that? Our scientists will discover matter, solid, liquid and gas while performing fun experiments. Children will have ample opportunities to be active this summer either in our outdoor playground or on the Gerstung equipment and Imagination Playground located in our gym. Children entering kindergarten may join the primary camp or may be eligible for some of our elementary camps. Full-day participation is strongly recommended (but half-day is also available), and extended care is also offered. Sign up for as many or as few camp weeks as you like.